I've always been one for trying new foods, and trying a new grain in my sourdough baking seemed like a pretty fun experiment to me. I picked up a little packet of the peculiar looking grain, Khorasan, from my local health food shop last week. 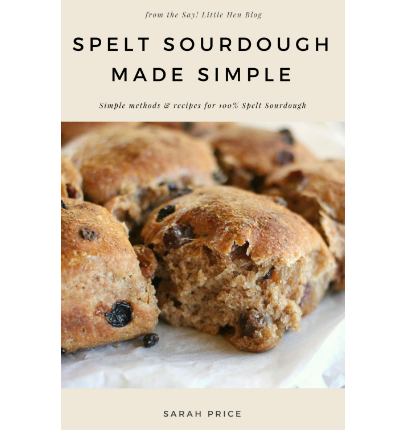 I'd heard of it a few times whilst reading sourdough recipes around the web and was intrigued. Once home, I did a little bit of research to see if anyone had any special baking tips to share when using Khorasan. Khorasan is an ancient variety of wheat. You may know it better as Kamut flour, which is a trademarked brand. Whilst containing gluten, Kamut says that many people with gluten sensitivities can enjoy this grain problem free. A few pages I came across said that Khorasan was a very thirsty flour, needing a lot more water than other grains. And another said that it was elastic and perfect for breadmaking, whilst also warning that it can become crumbly if worked too much. I didn't think this would be a problem, as similarly whole spelt flour can also become crumbly and tight when overworked. Now since I purchased the grain itself, my bread has obviously been made with freshly ground whole grain Khorasan flour. I imagine that if you purchase the sifted flour it will be different again, as is usual. My first loaf was a bit of a pancake. Frightened of overworking the dough, I barely kneaded it (despite my inner experienced baker screaming knead it more!). On top of that I let the dough be quite wet, hopeful of creating a more open crumb. Luckily I'd made it to go with soup. It would have also worked well as Soldiers with boiled eggs, without the need to even chop it into sticks. It spread a lot. Appearances aside, it was delicious, with a decided sweet note and beautiful golden colour. The crust was quite thin and nicely crisp. I had enough grain left to make another loaf, which I did. It is the loaf above and it is much improved. This flour is incredibly thirsty. I added 300g of water straight up and had to add more, although I didn't weigh the extra. I mixed everything together, and let it sit for 30 minutes before turning out onto a floured surface to knead. I'm amazed at how different this ancient wheat is compared to regular wheat. The dough was soft and buttery, it felt like an enriched dough under my hands. It was a dream to knead. After achieving a smooth, slightly sticky dough with 5 minutes kneading, I shaped it into a ball and returned it to the covered bowl for 40 minutes. Then I oiled my hands and the silicon mat and gave it another quick 1 minute knead. The dough was still feeling deliciously buttery but also very elastic and bouncy. I shaped, floured and popped it into my prepared banneton where it proofed for 2 and a half hours. I baked this loaf in a pot as I was somewhat afraid of it spreading again, but I don't think it would have anyway. I baked it lidded for 20 minutes at 220°C, then removed the lid and dropped the temperature to 180°C for a further 20 minutes, then for the final 18 minutes I removed the loaf from the pot and onto a tray, to allow the crust to colour up more. It took longer to bake than a spelt loaf of this size.The flavour is sweet and mild, and the texture pleasantly chewy. The interior crumb is a beautiful soft golden yellow, without being at all tight from the extra kneading. I'm looking forward to purchasing some more Khorasan and trying out more sourough loaves. 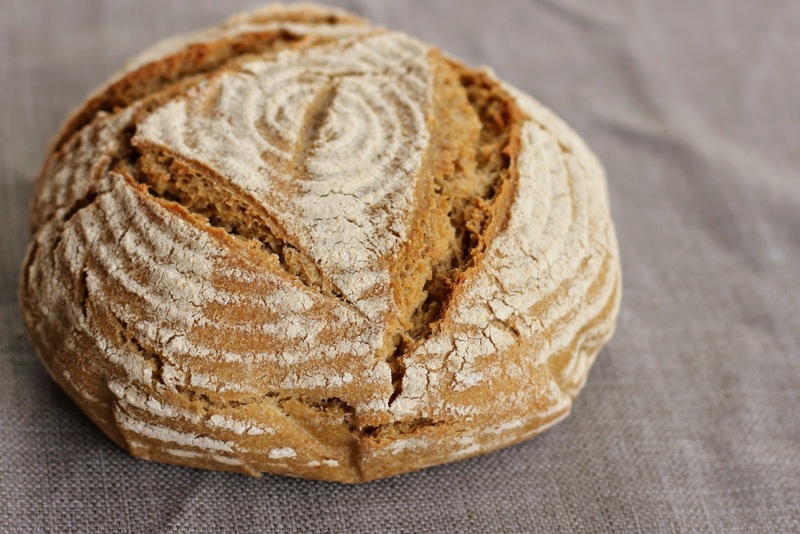 Have you ever baked with Khorasan wheat? Have you any tips for working with it? Do you like to experiment in the kitchen? I have great results using the no knead method. An added bonus is that the very long rise makes the bread much easier to digest and the vitamins and minerals much more absorbable. It works for all flours and flourmixtures. Spelt/rye/wheat is one of my favorite mixes. And good quality organic flour or grain is essential to the quality of any bread, as I imagine you know. A long rise improves the flavour, doesn't it? And yes it makes it much lighter too! I like experimenting in the kitchen, with varied results :-) I've never heard of Khorasan wheat but the bread looks lovely, all that is needed is a little butter and a cup of tea.